Artisan, small scale, minimally processed, organic: all these adjectives delight local food enthusiasts. But there’s another adjective, perhaps less often on our minds but always on the minds of the local farmers who feed us: safe. On a field trip to Layne Sundberg’s Quail Croft goat diary on San Juan Island, a group of us interested in local dairies learned that dairy farmers focus constantly on cleanliness and on potential sources of contamination to minimize any risk of illness from their milk or cheese. The final product that we all enjoy is due to healthy animals and the very careful handling of their milk. When we arrived, Layne’s twelve friendly, snow-white Saanen goats crowded up to the fence of their tidy, sloped goat yard outside the barn. We scratched their bony heads as Layne explained that all were pregnant; there would soon be twenty to thirty little kids and lots of milk for cheese. 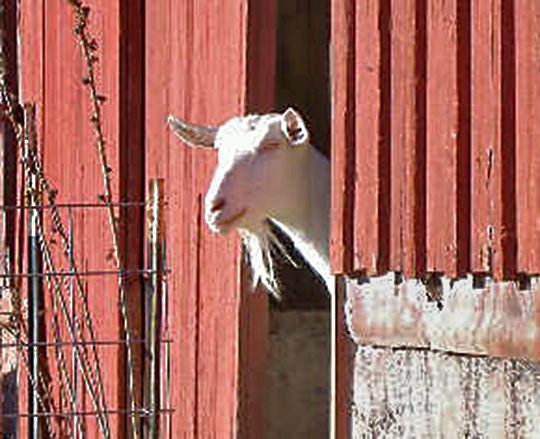 A ramp led from the goat yard up to a door in the barn wall and into a three-goat milking parlor. Layne described how she brushes each goat as it comes in, removing any loose hair from the udders before sanitizing them in an iodine solution. We admired the bright blue stanchions where the goats stand as Layne milks each by hand, and she explained that the painted wood surfaces are easier to clean. Separated from the milking parlor by a close-fitting, self-closing door, the milk handling room is another study in cleanliness: one sink for washing hands and another double sink for washing and then rinsing milking equipment. After she’s milked the goats, Layne carries the milk into this room, filters it through single use filters into five-gallon food-grade plastic buckets, snaps on lids and puts the buckets into a chill tank that cools the milk to 40 degrees in less than two hours. Once cooled, the milk is refrigerated until Layne turns it into cheese. In addition to her careful handling of the milk, Layne said that inspectors test the milk three times a year for harmful bacteria. Across the farmyard in the cheese kitchen, there’s another set of sinks—“You’re washing dishes all the time when you make cheese,” Layne laughed—and a $20,000 pasteurizer Layne bought to comply with federal regulations that the goat milk she uses for her soft goat cheese be pasteurized. Hanging on the wall is Layne’s Washington State Milk Processing Plant license authorizing her to produce pasteurized soft goat cheese and aged goat cheese. All this equipment—particularly the pasteurizer—and the three remodeled rooms are a huge investment, especially for a small farmer, and paying for them through small-scale production is a real challenge. As we demolished logs of delicious herbed goat cheese as well as a round of aged goat cheese Layne’s developing, we felt immensely fortunate that local farmers spend long hours and take on big debt to feed us so well. A few days later, back on Lopez, Brian Kvistad, who carries Layne’s cheese at his Blossom Natural Grocery, said that he’s sold more of her cheese than ever as a result of our dairy field trip. I’m not surprised. If you haven’t tried local goat cheese yet, you have a treat in store. It’s artisan, small scale, safe and delicious! Layne Sundberg’s Quail Croft goat cheese is available at Blossom, at the San Juan Farmer’s Market and at Synergy Farm on San Juan. It is served at Steps and at Friday Harbor House.